A stunning ring crafted in 18ct yellow gold adorned with alterning sparkling diamonds and sapphires, flanked by two rows of sparkling diamonds. Totalling 0.33cts, this ring is the perfect way to express your love. 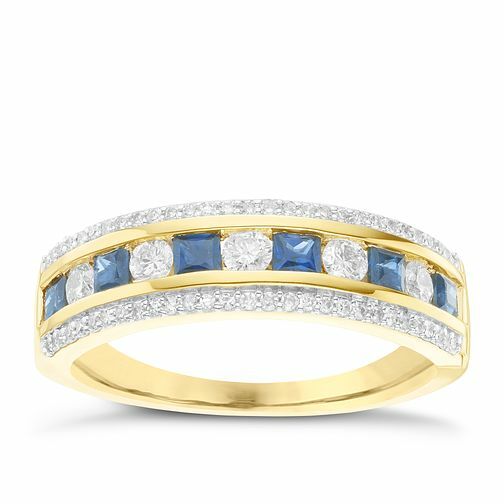 18ct Yellow Gold 0.33ct Diamond & Sapphire Ring is rated 5.0 out of 5 by 1. Rated 5 out of 5 by Anonymous from Brought for my mums 50th The sapphire and diamond bands make it a little different to the usual diamond/Sapphire rings. It definitely catches your Eye and it received many positive comments from my family when we was making the decision of which ring to choose for my mum. I have to say it was a bit of a steal when we got it on offer. And my mum was very happy with her gift! All in all a beautiful ring!